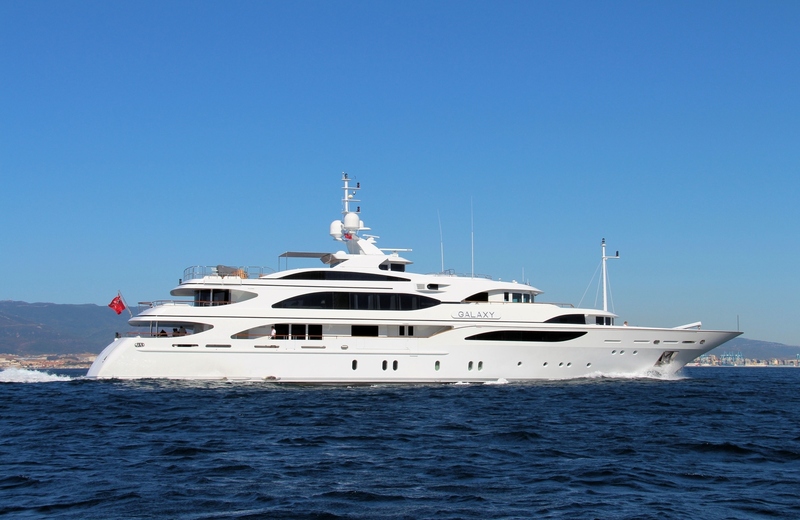 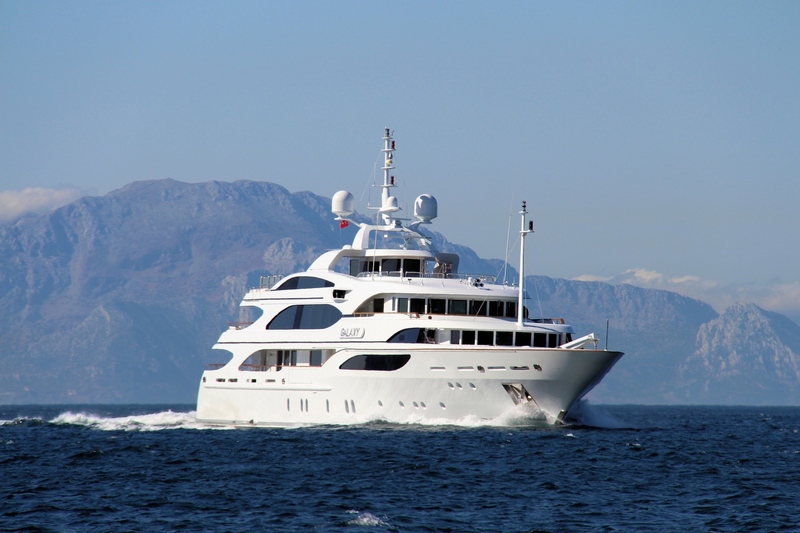 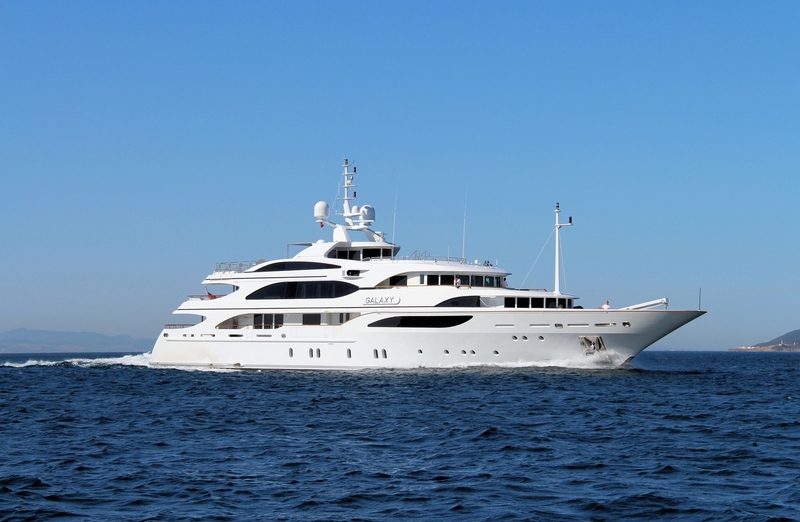 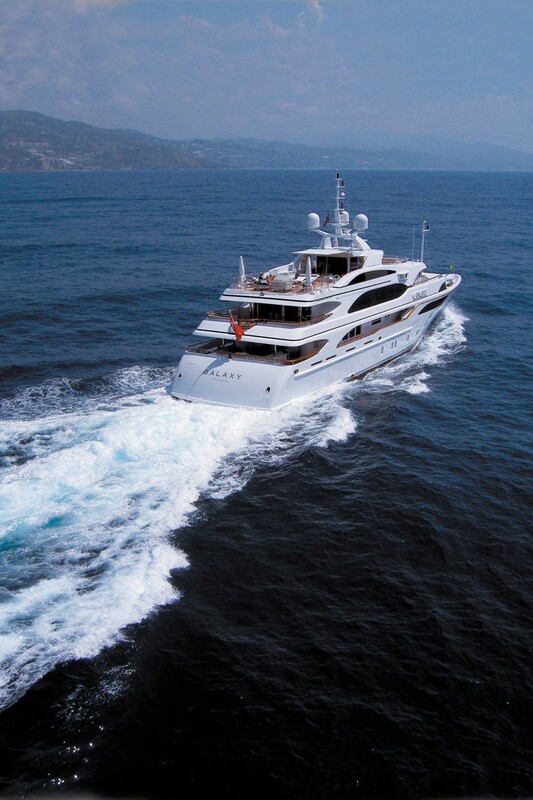 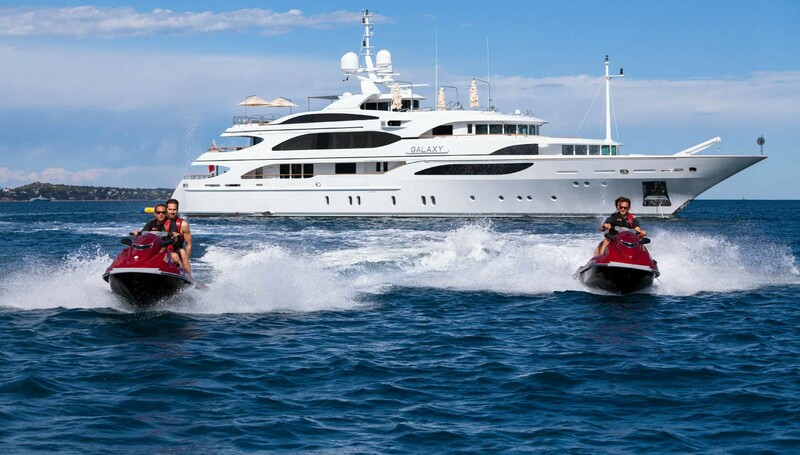 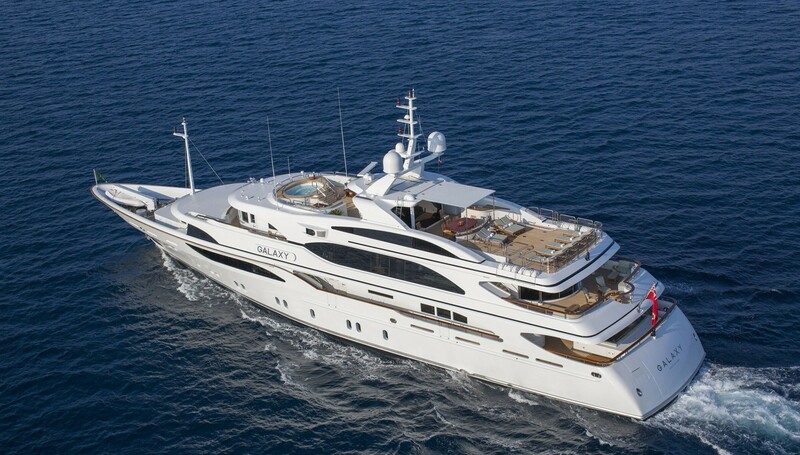 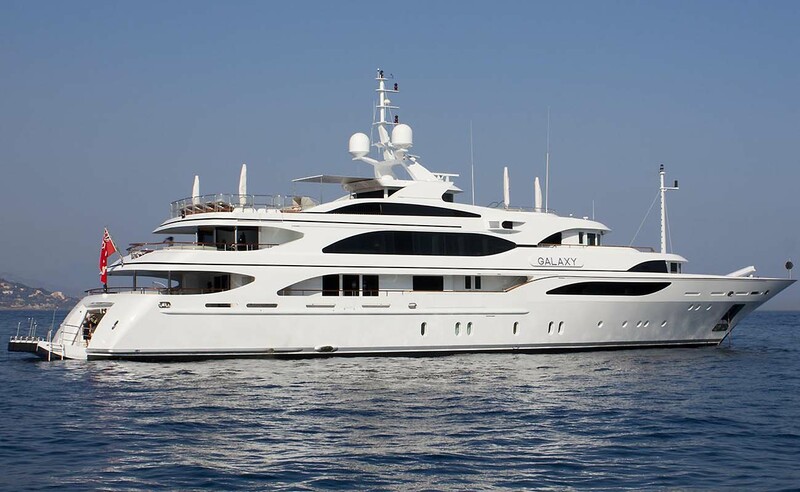 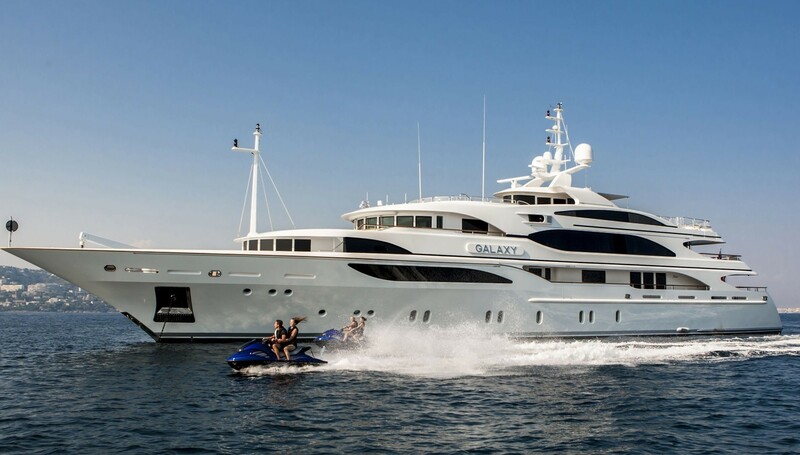 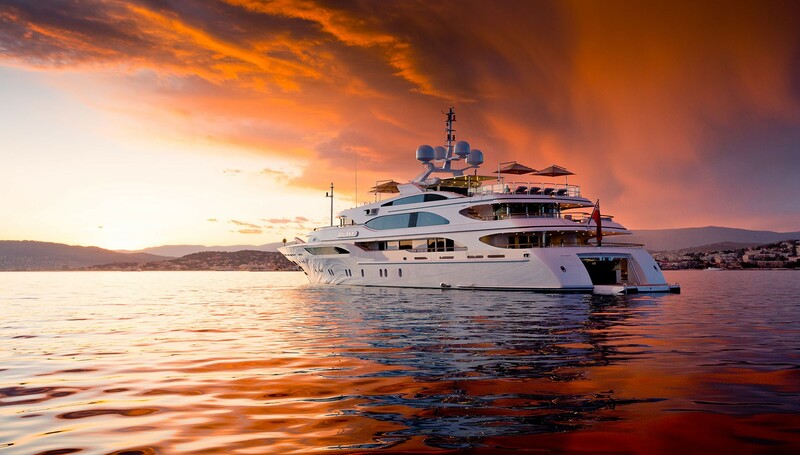 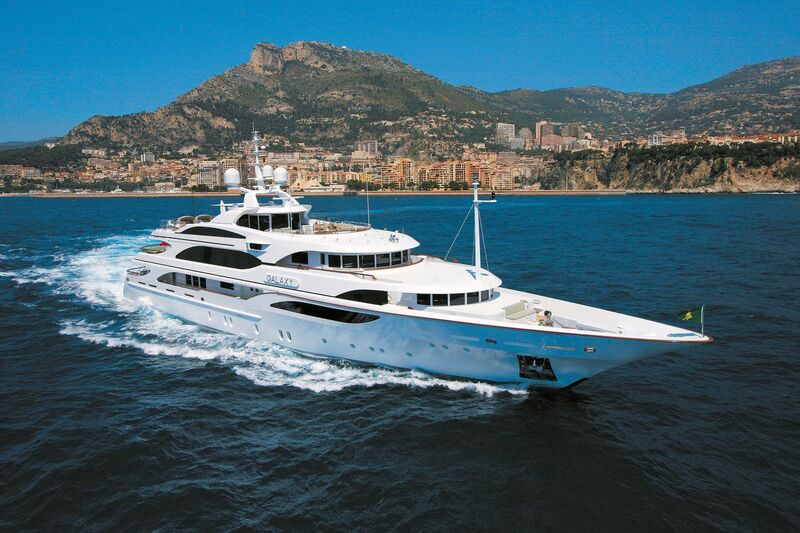 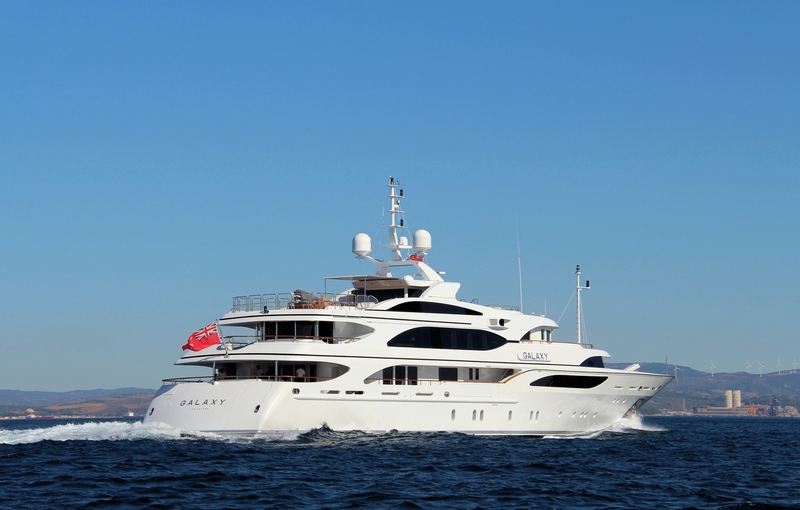 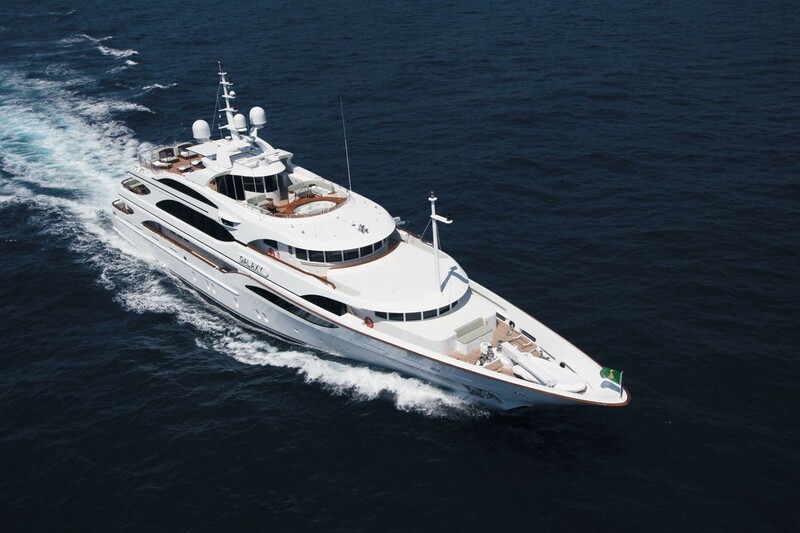 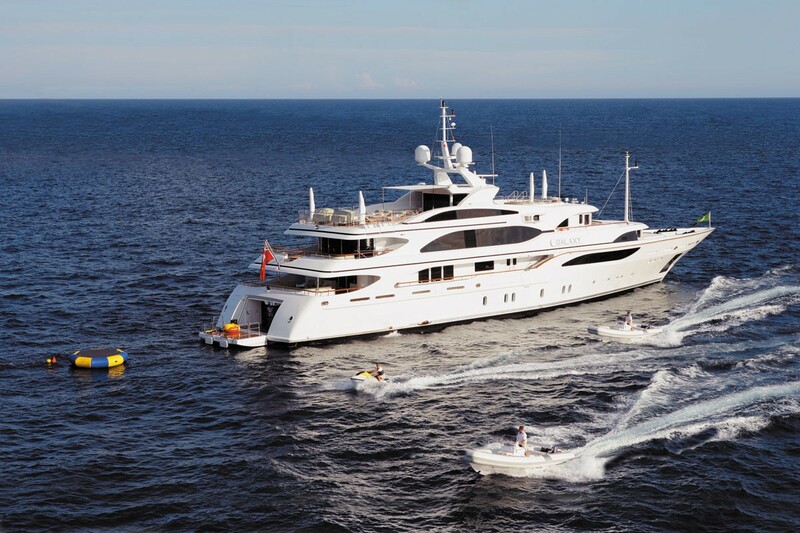 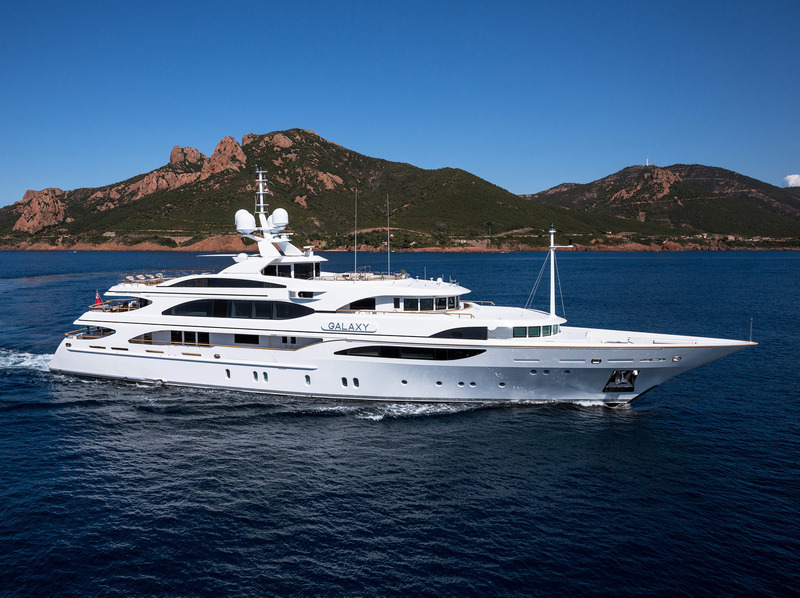 Luxury 56m motor yacht Galaxy was built by Benetti in 2005 and was last refitted in 2014. 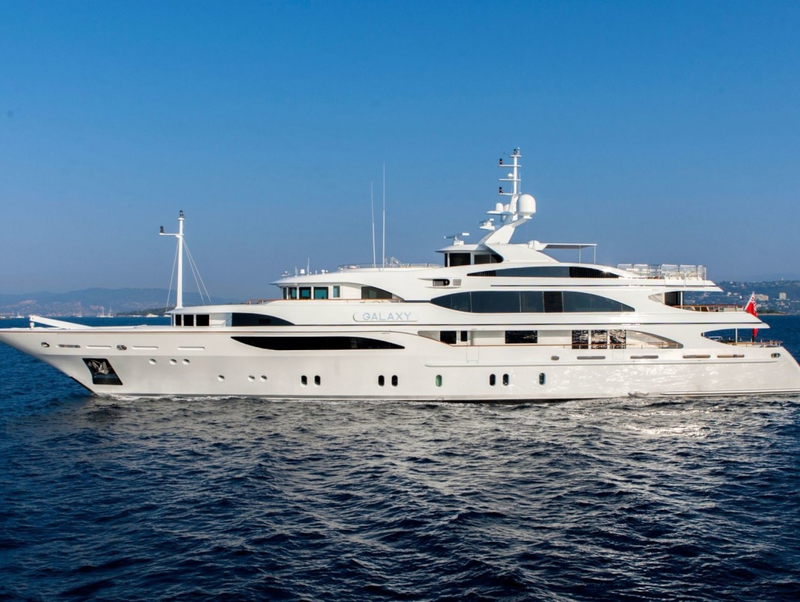 Galaxy was the debut product of Benetti’s Italian yard, Livorno, and she has been superbly designed inside and out by Stefano Natucci. 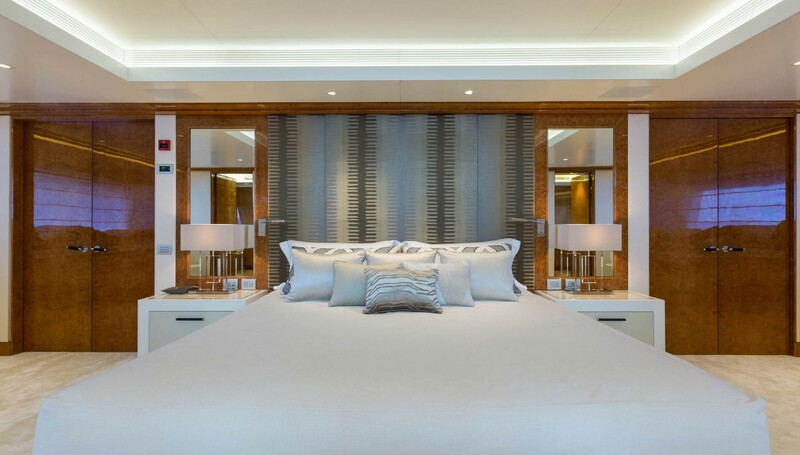 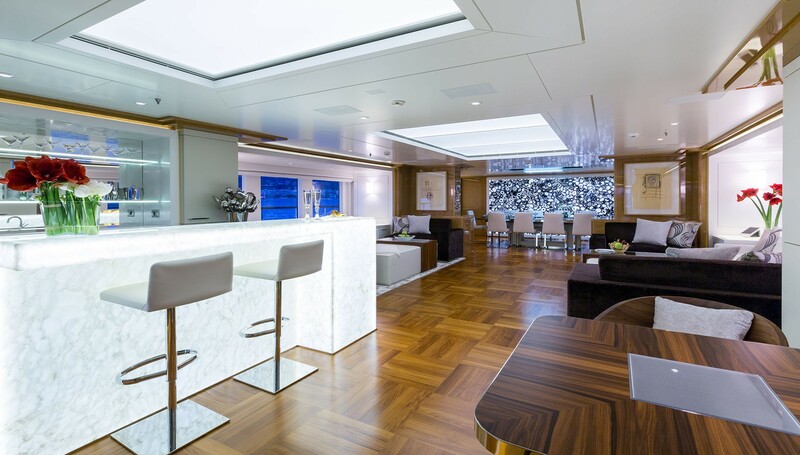 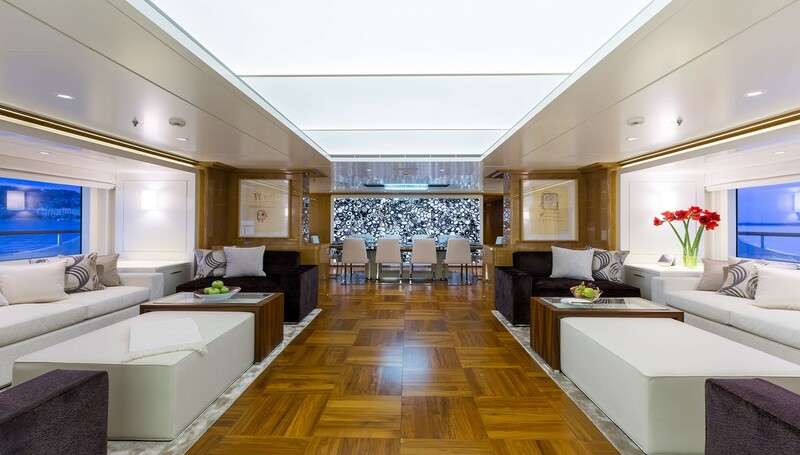 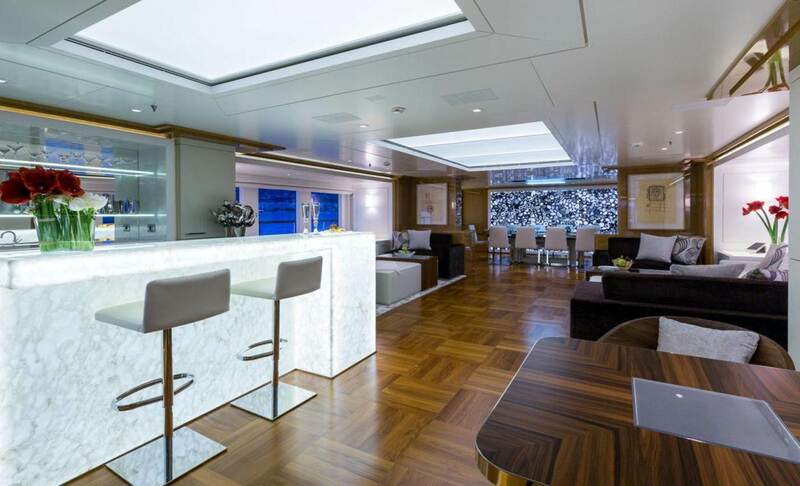 Galaxy boasts unusual exotic woods, including oak, maple burl, eucalyptus, European plain tree and sycamore, and also interesting marbles rarely seen on luxury charter yachts. 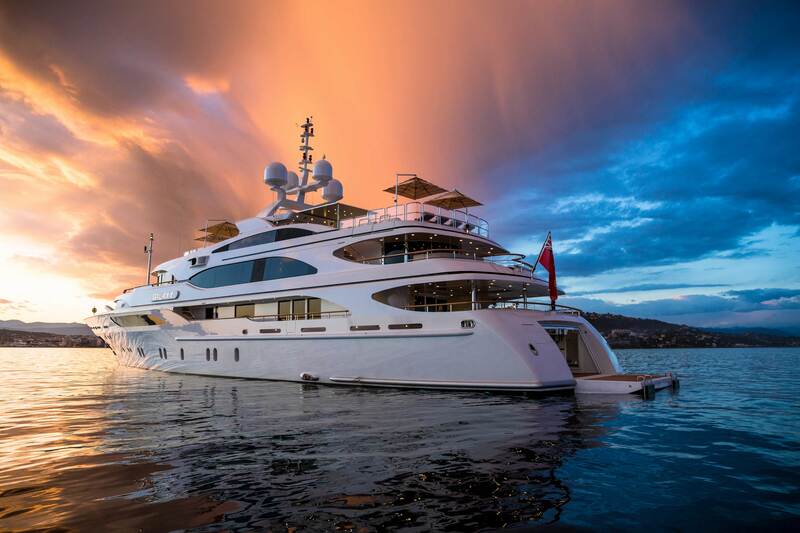 A wine cellar, a fully equipped exercise gym, a Spa Pool, an elevator between all floors, include the various additional amenities which add to her charter desirability. 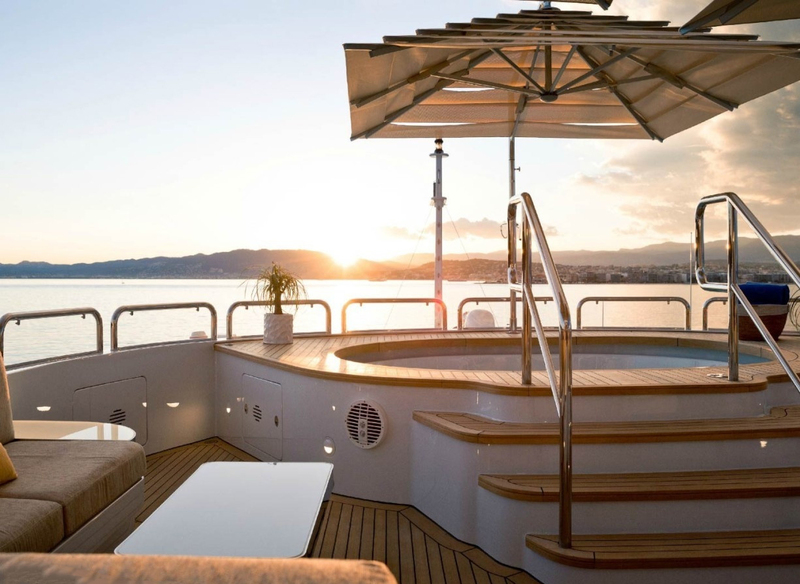 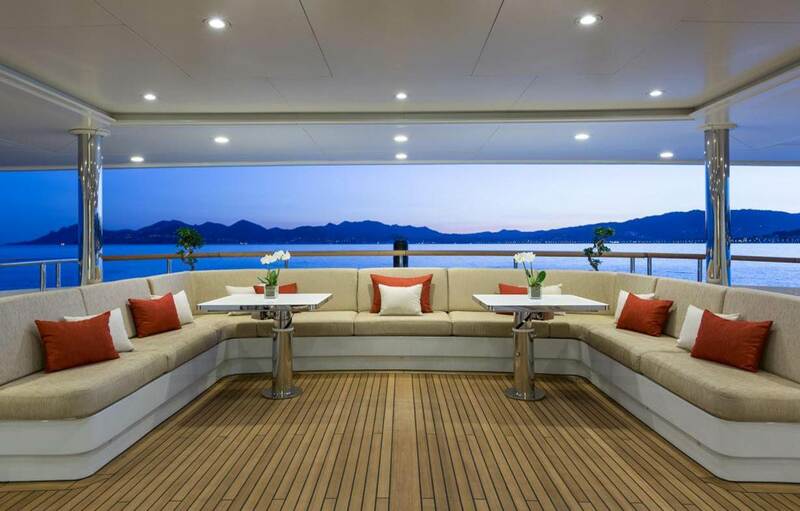 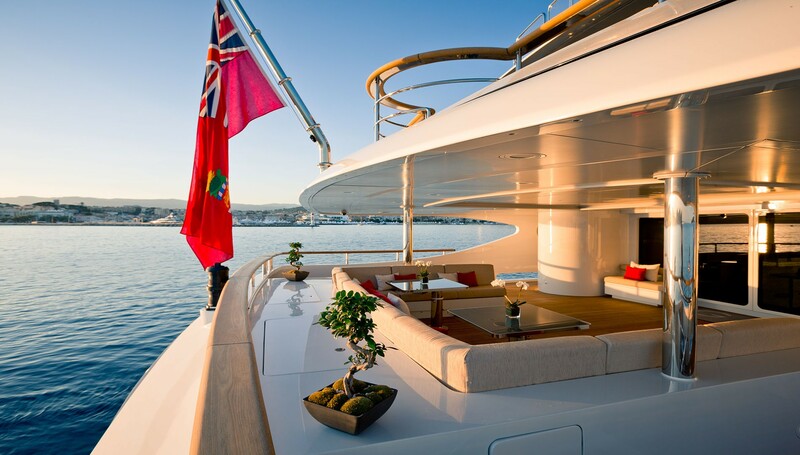 Her aft deck reveals a large built-in sofa which benevolently accommodates a dozen or so sun worshippers and afternoon party-goers. 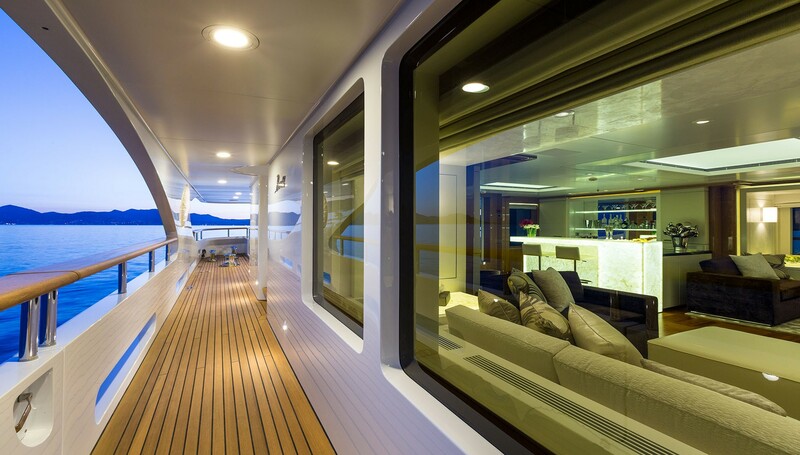 The Flybridge has been wonderfully and imaginatively designed. 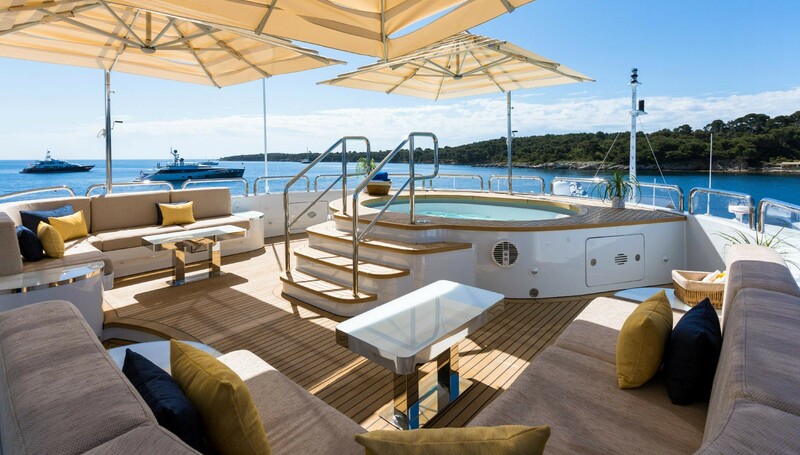 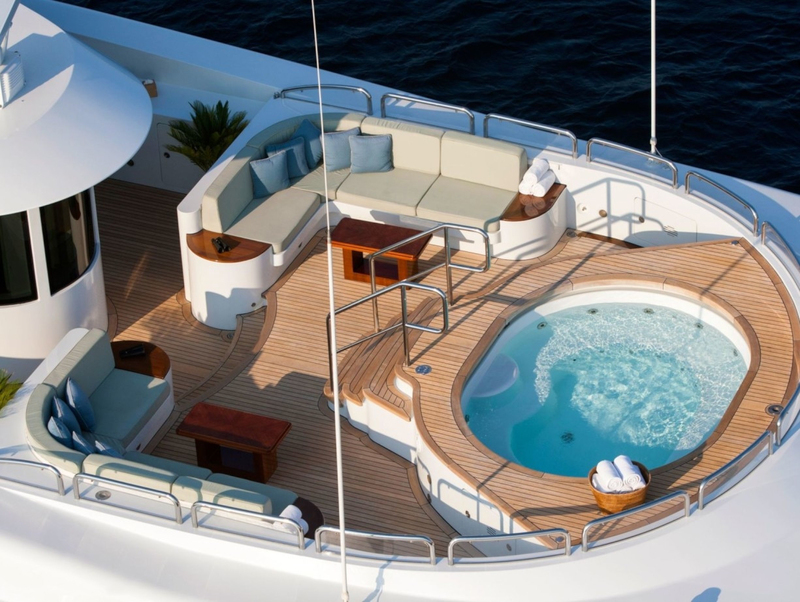 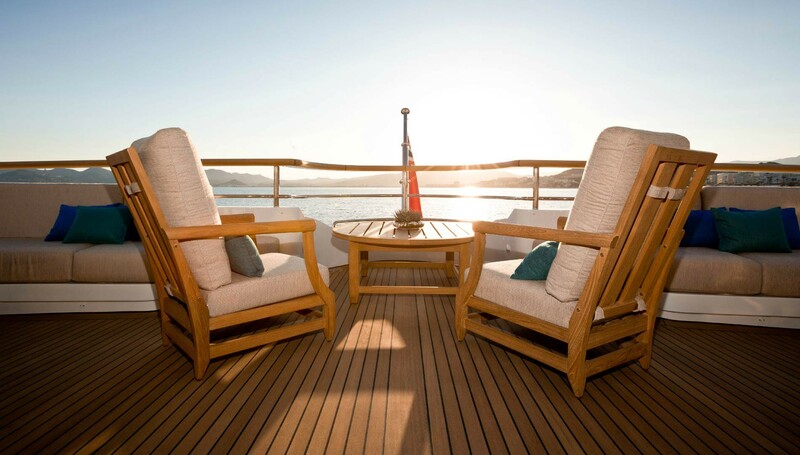 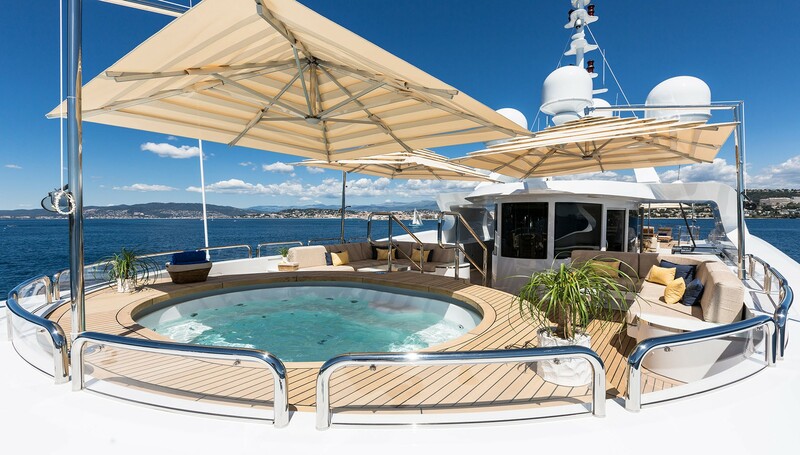 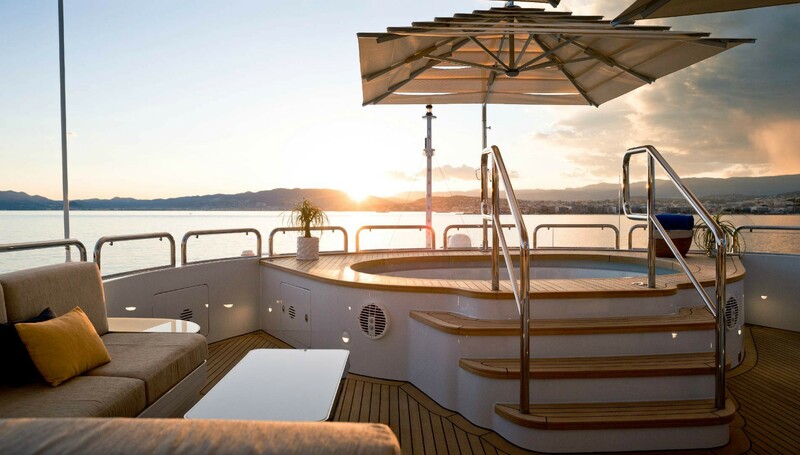 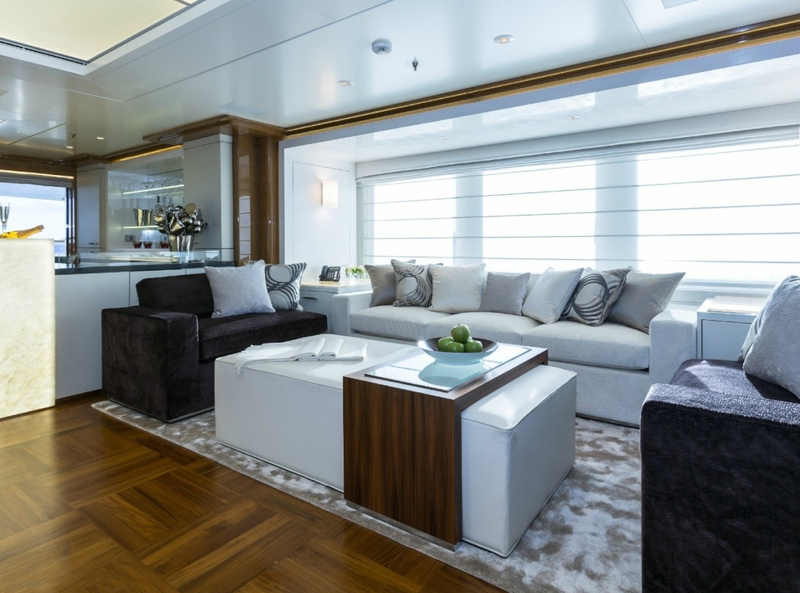 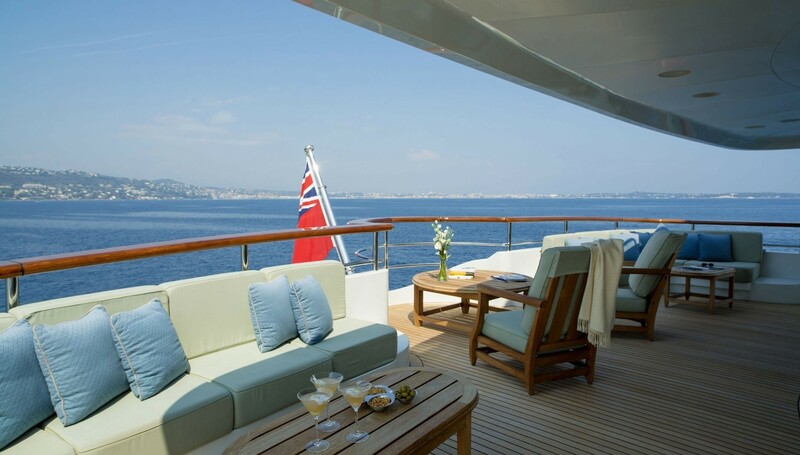 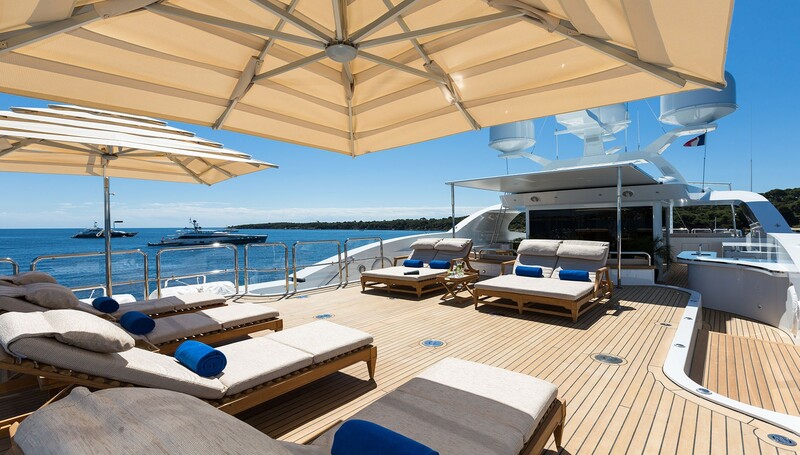 Her Sun Deck is ideal for complete relaxation with its five sunning lounges, bar area, and dining & snack table (as serviced by the dumbwaiter). 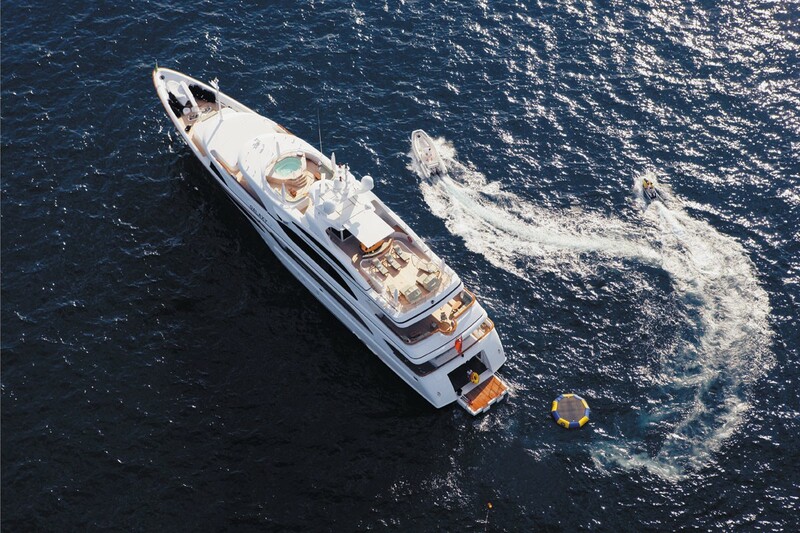 This area can also be used to land a helicopter. 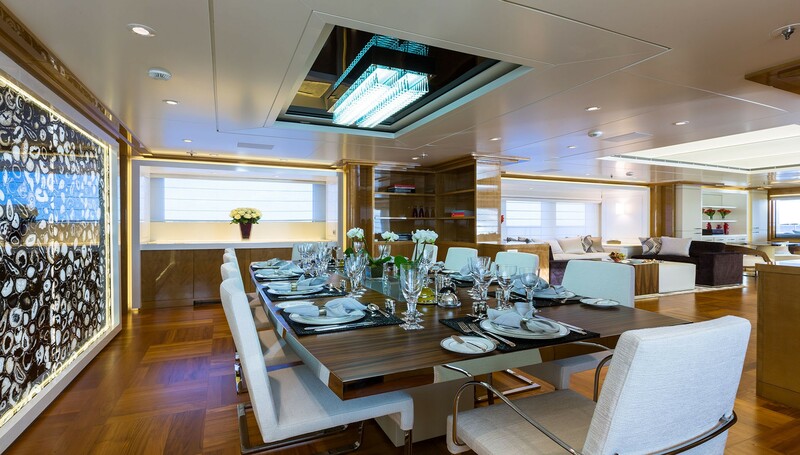 Dining and entertaining can be either formal or informal depending on the moment. 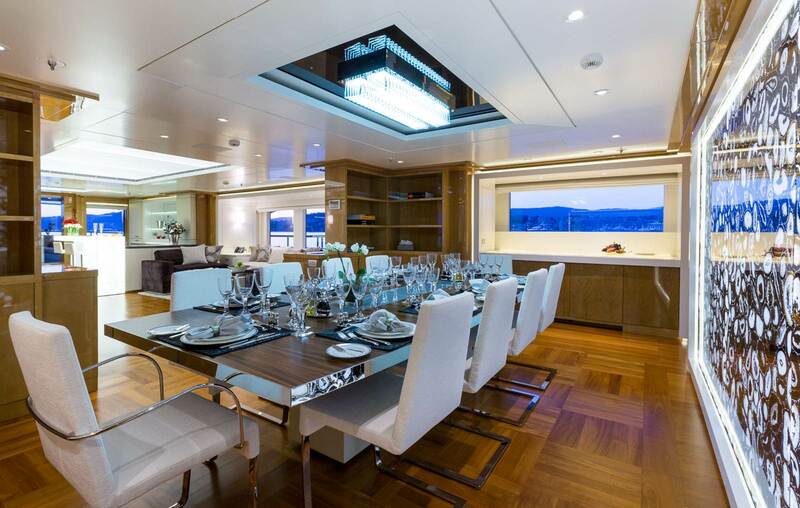 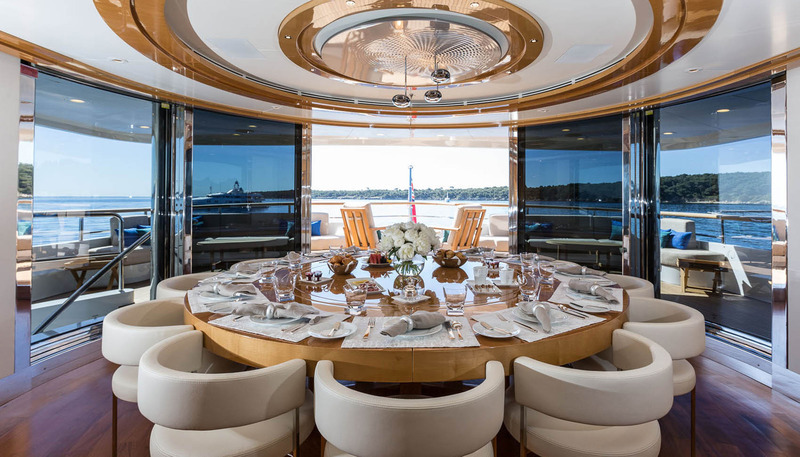 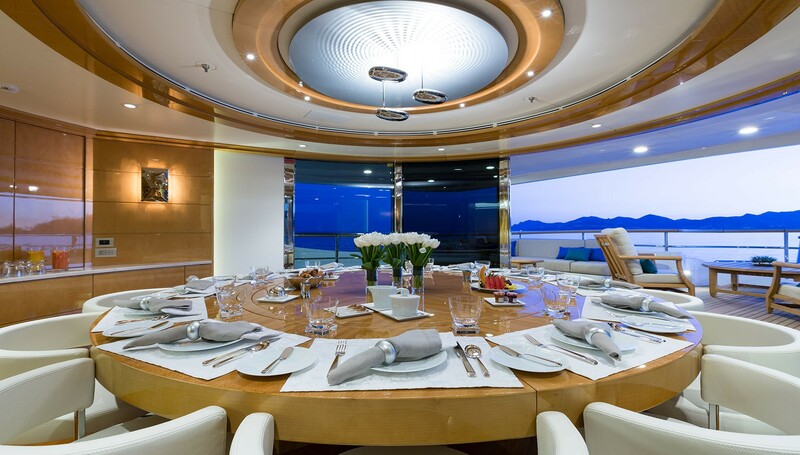 Her upper deck Sky Lounge features an impressive glass paneled dining room and circular dining table. 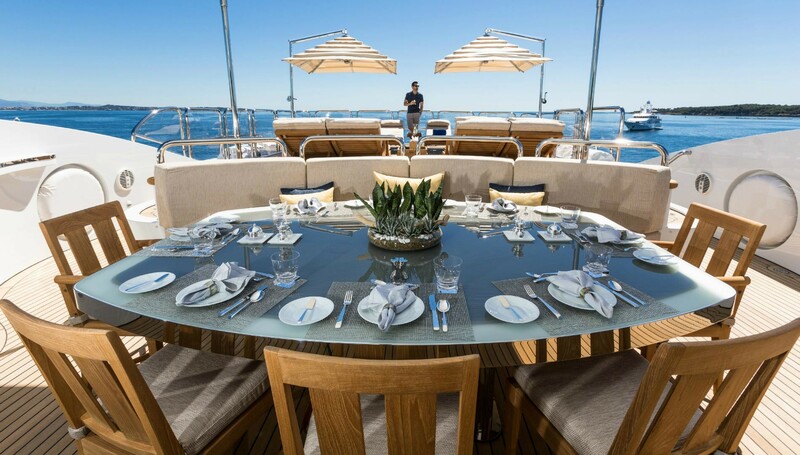 These glass panels slide open to reveal a superb 180-degree view from beautiful alfresco dining setting. 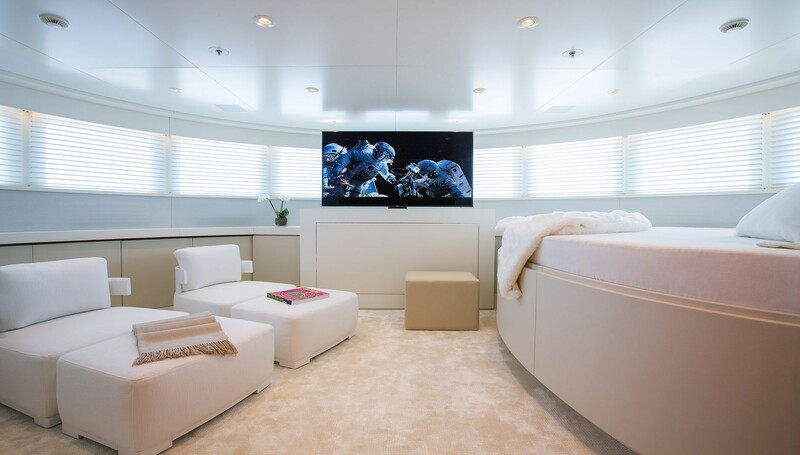 Visual screen entertainment is represented by a 42-inch plasma screen and a 77-inch retractable screen for the cinema. 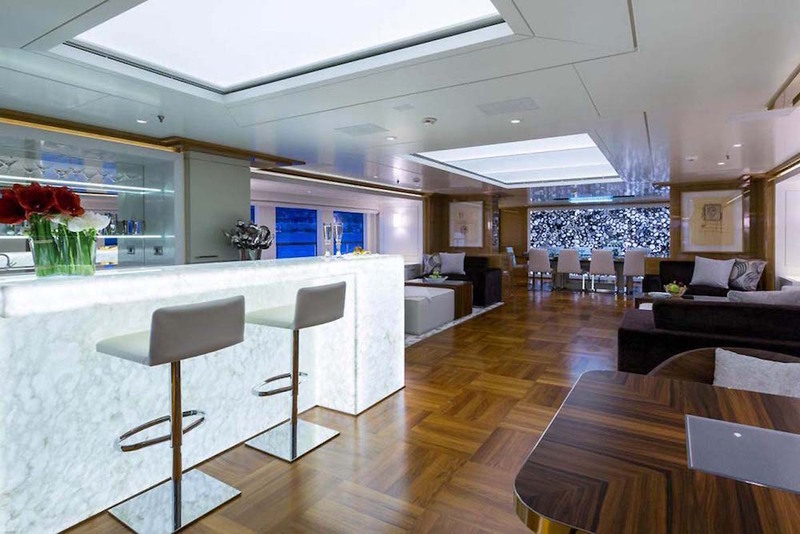 The upper deck Sky Lounge salon offers chat areas, gaming tables, couches, and of course a fully stocked bar. 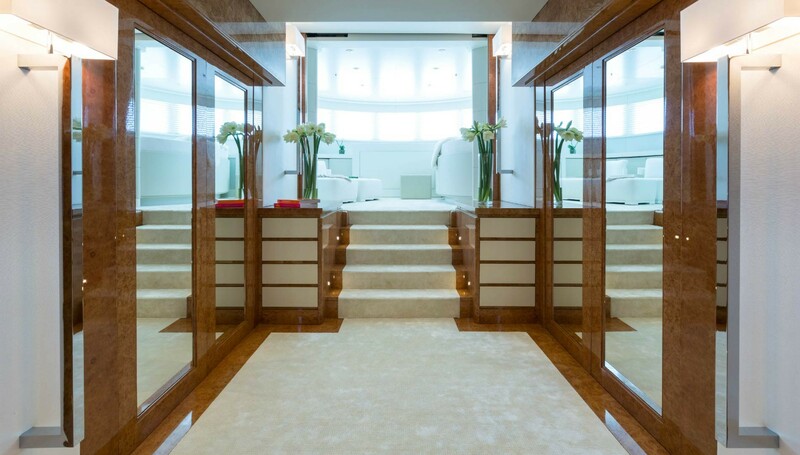 A stroll through Galaxy’s twin automatic sliding doors will bring you inside her voluminous salon which features a lovely airy décor of beige and cream. 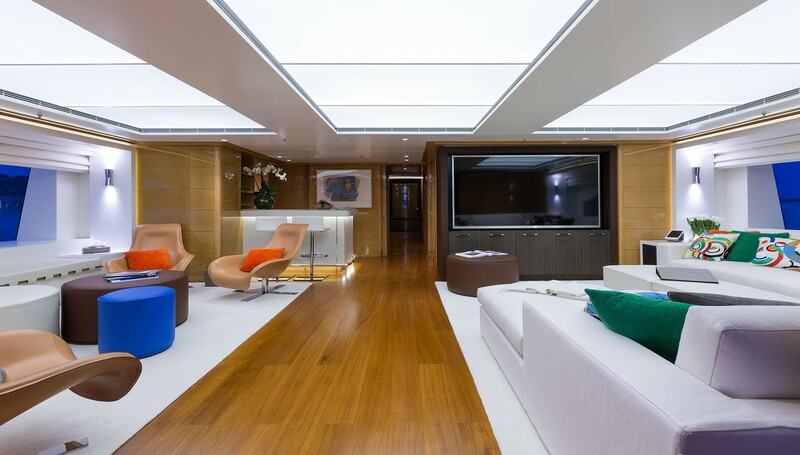 She is a modern yacht with efficient and simple use of space and shape as detailed with the use beautiful sycamore woods. 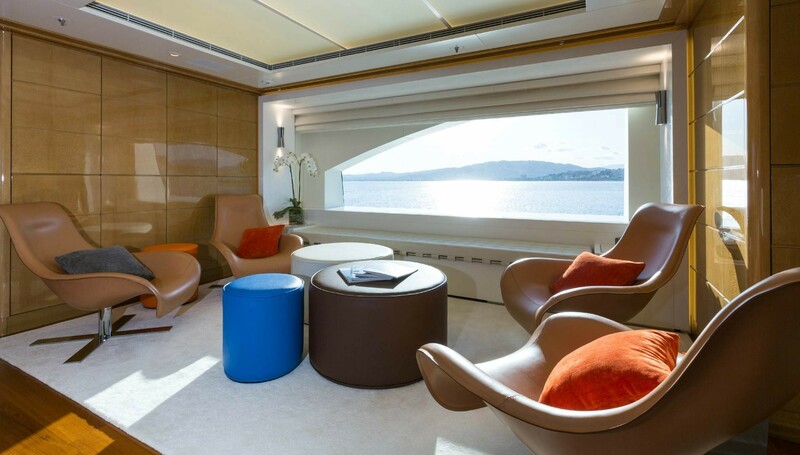 Geometric coffee tables face the staid couches, and all forms work together as one considered entity. Two pop-up 50-inch plasma TVs, which are of course linked to DVD and satellite, further the modern and functional style. 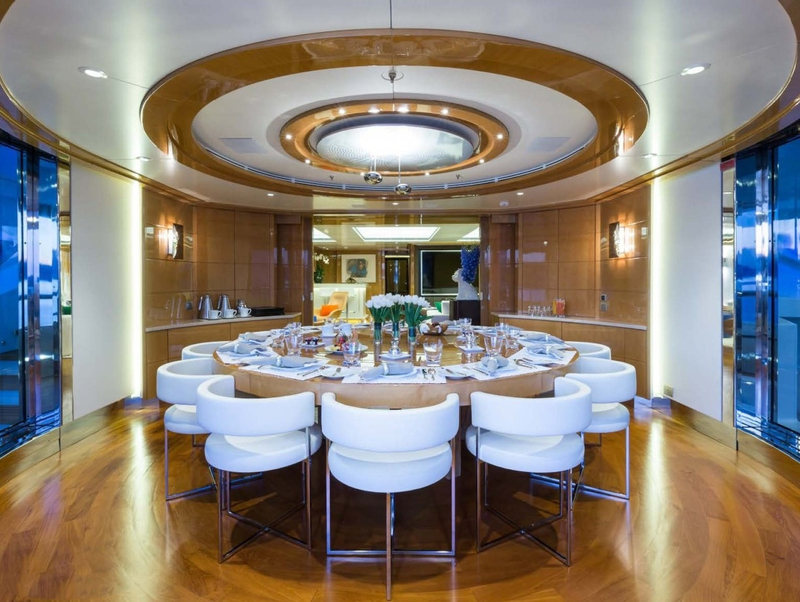 The formal dining room seats up to as many as many as 14 guests (pictured below), at her generous European plain tree dining table. 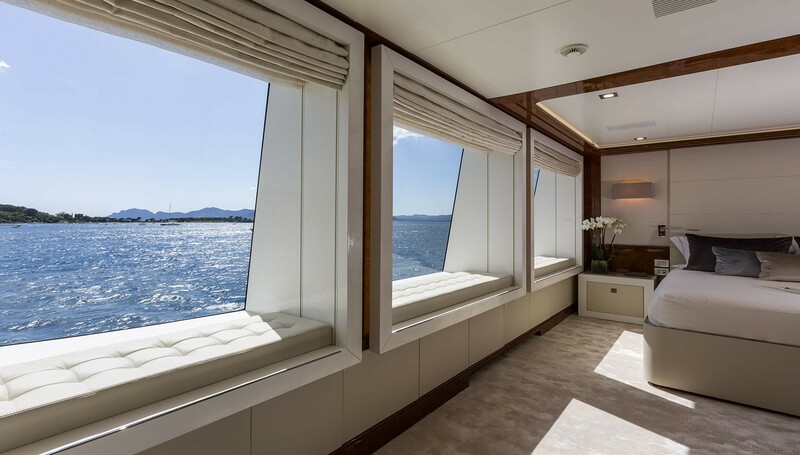 Her panoramic windows positioned on each side of this full beam width salon provide natural lighting and vista. 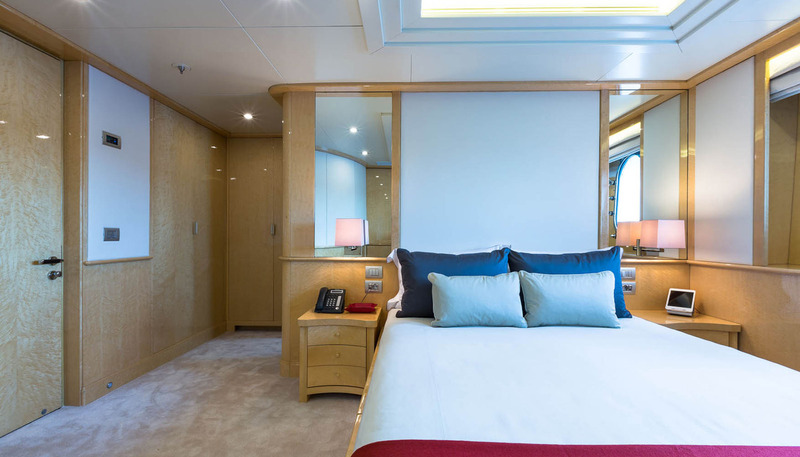 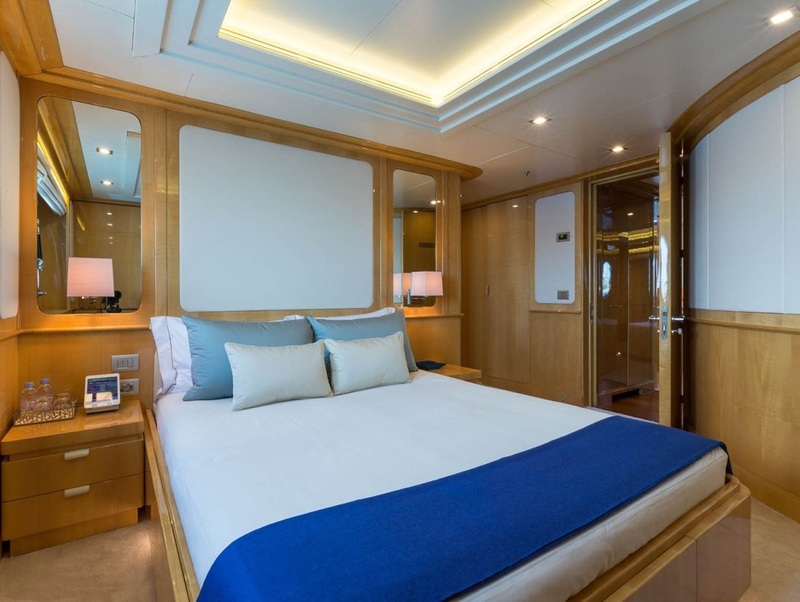 Galaxy offers stylish luxury accommodation for 12 charter guests in 6 staterooms, with the following layout: There is a luxury owner’s suite on the main deck, complete with panoramic views and Ensuite Spa Pool and VIP office. 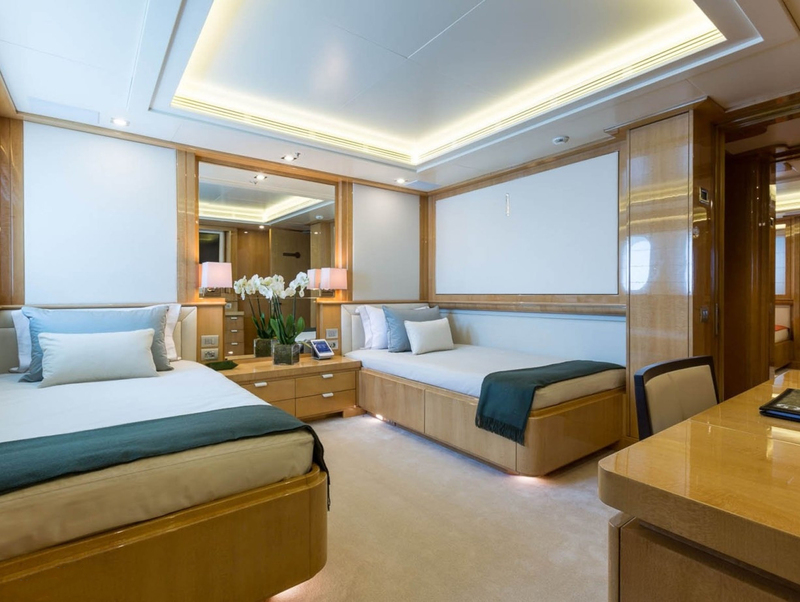 Her VIP stateroom is also on the upper deck while on the lower deck there is also two double staterooms and two twin cabins plus Pullman berths, (making room for up to a total of 14 charter guest) although 12 in the maximum. 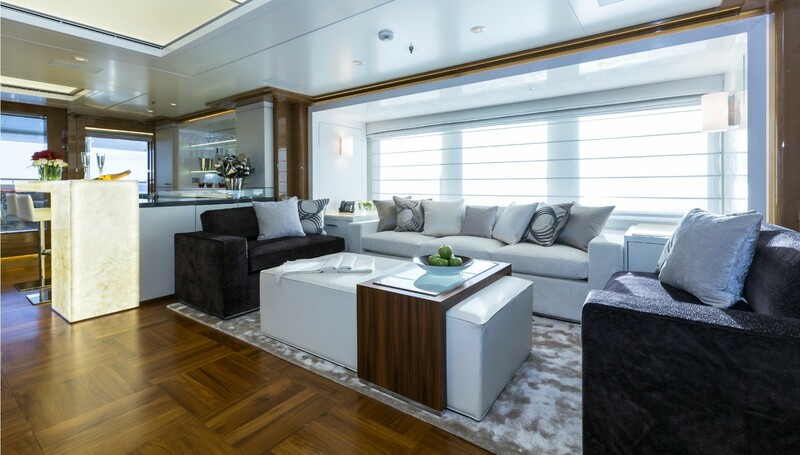 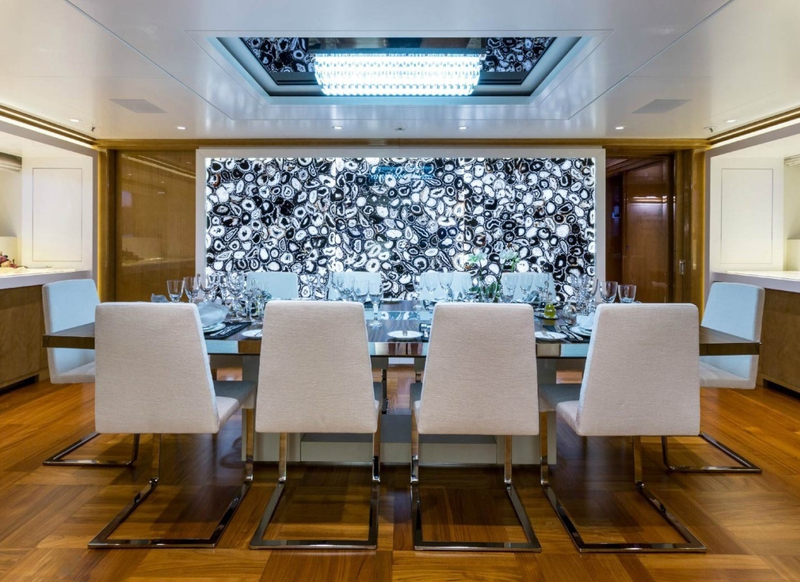 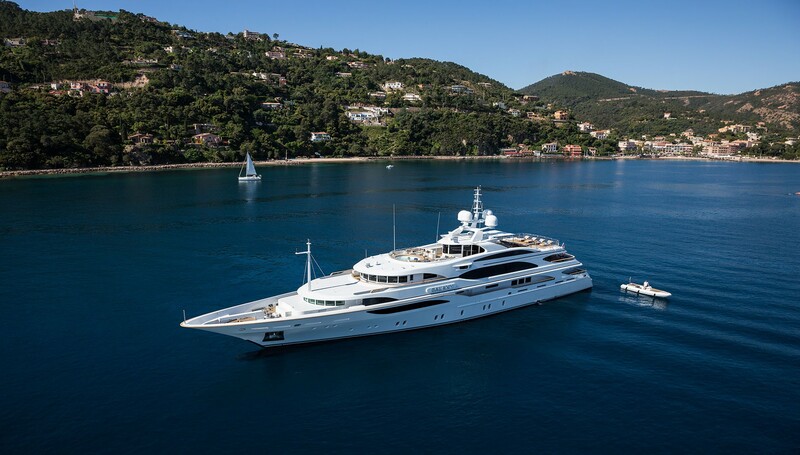 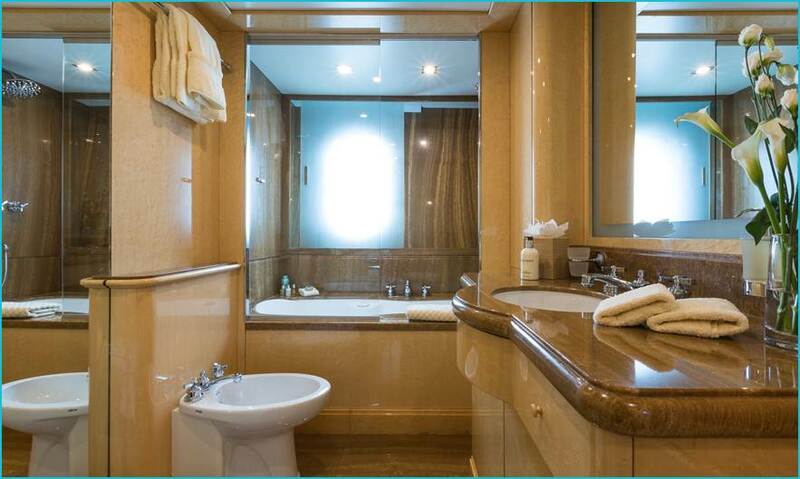 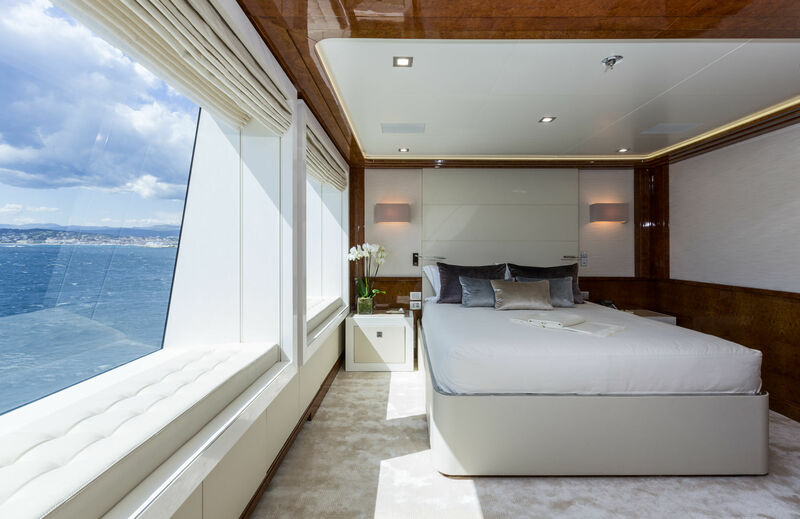 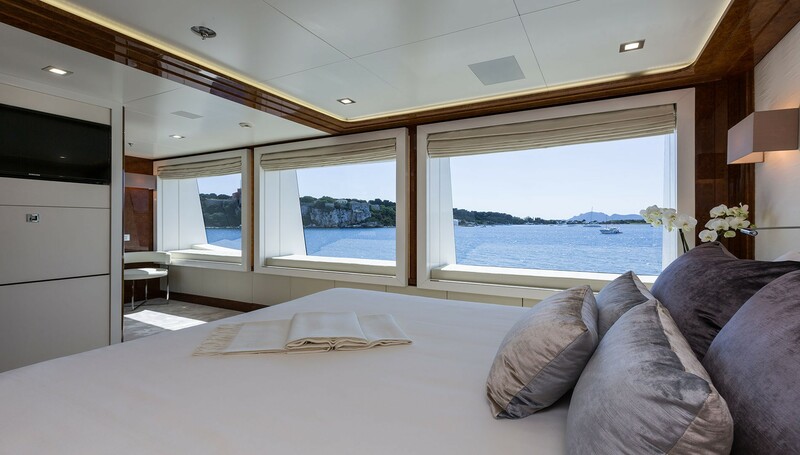 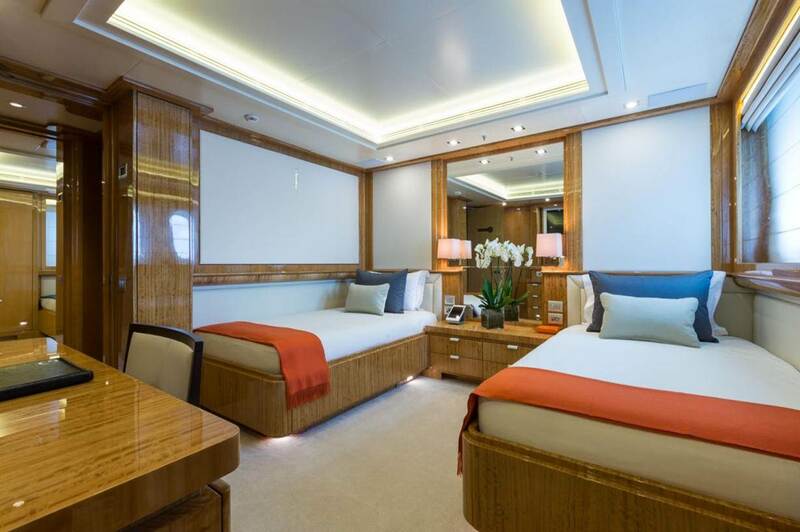 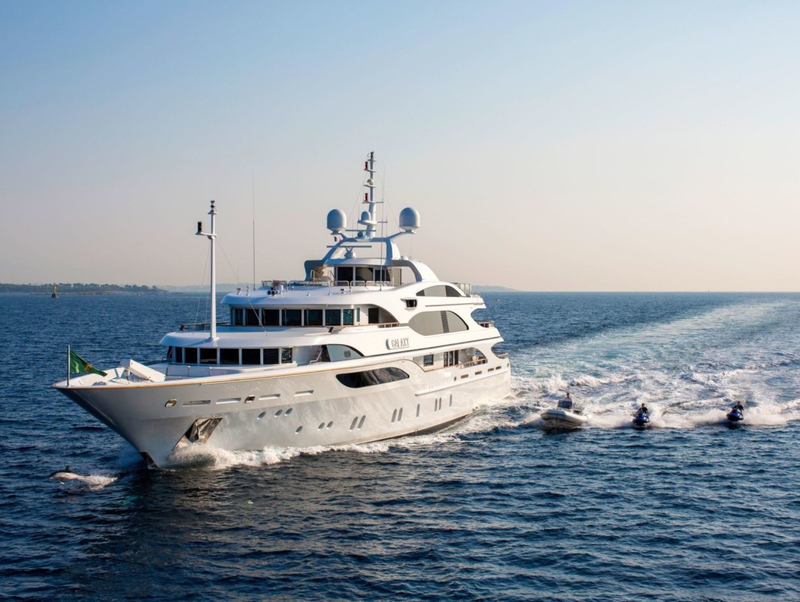 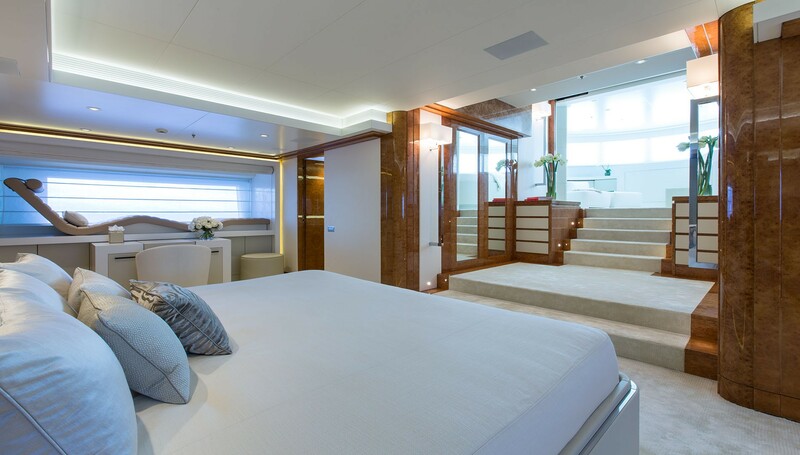 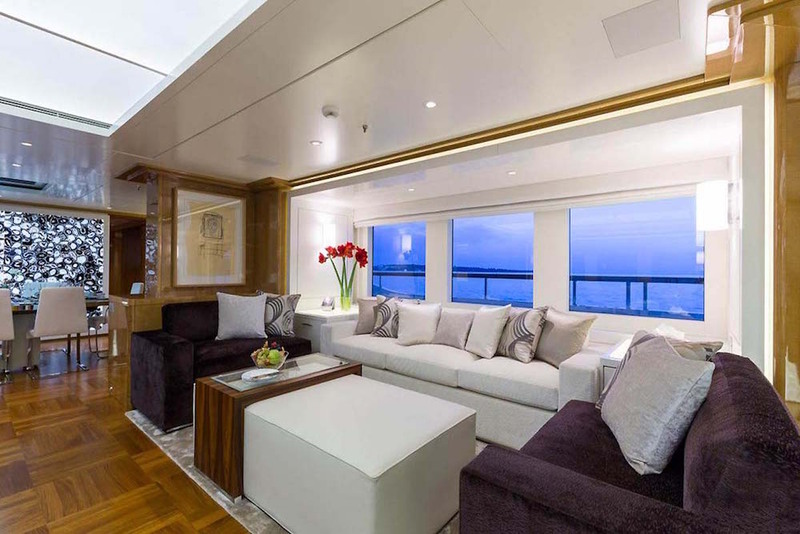 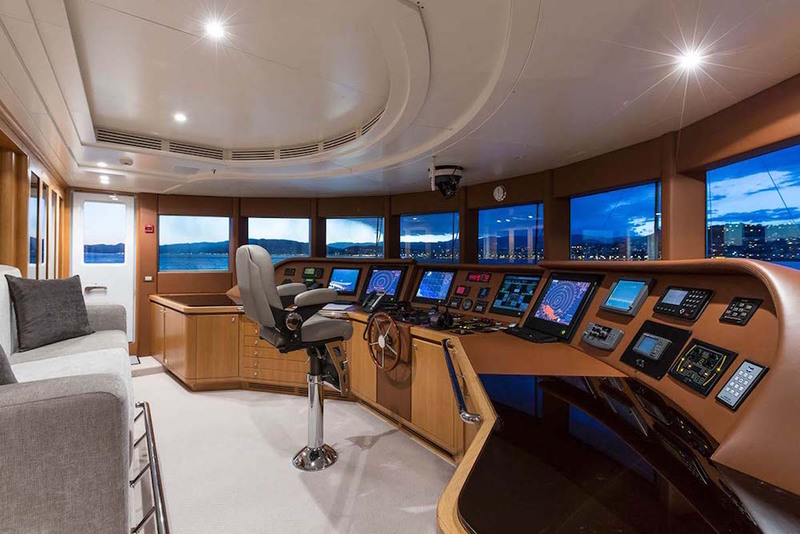 Luxury yacht Galaxy also has separate crew accommodation for as many as 14-16, in eight cabins (including the Captain’s stateroom on the upper deck and seven cabins on the lower deck). 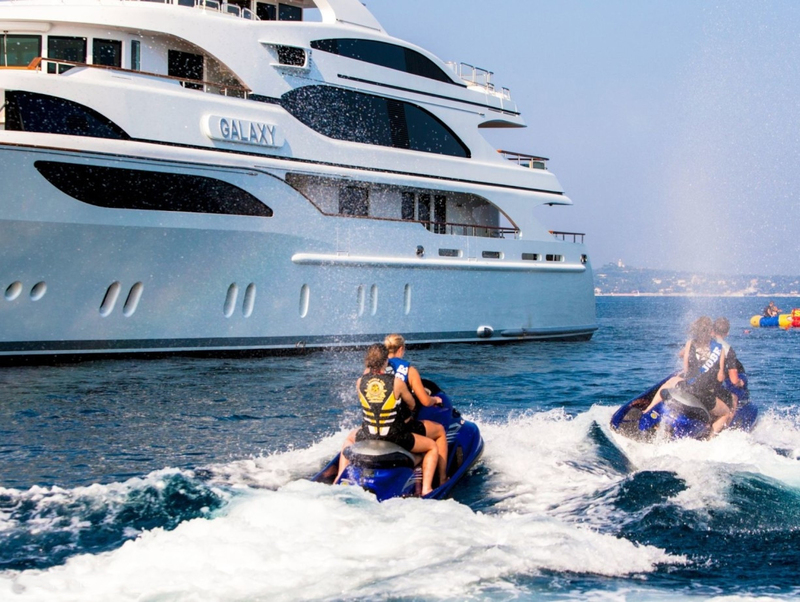 Tender & Toys include a Nouvurania 660dl (with 2x90hp Yamaha o/b), a Narwhal 4.8m RIB with 70hp o/b, two Yamaha Wave Runners, two Sun fish Sailboats, two Ocean Kayaks, a Windsurfer, an assortment of towable water toys and snorkelling gear. 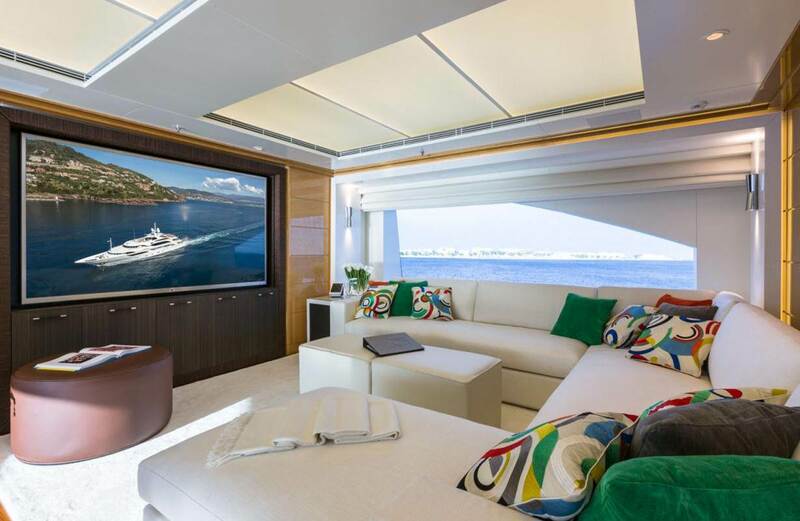 Audio Visual Electronic Equipment & Satellite TV to all of her guest areas and cabins - each with their own dedicated receivers. 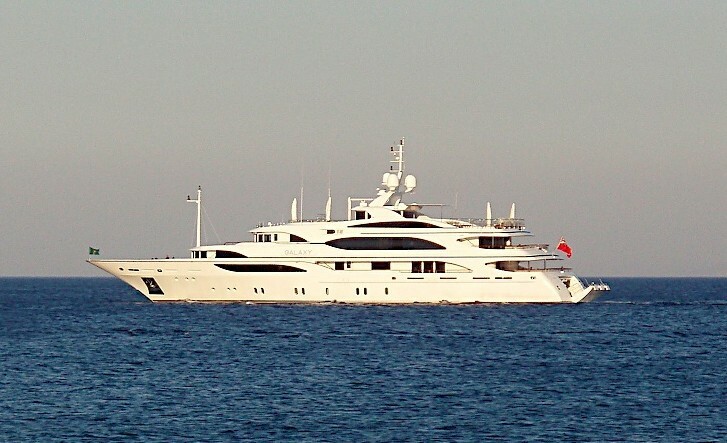 There is a D.V.D. 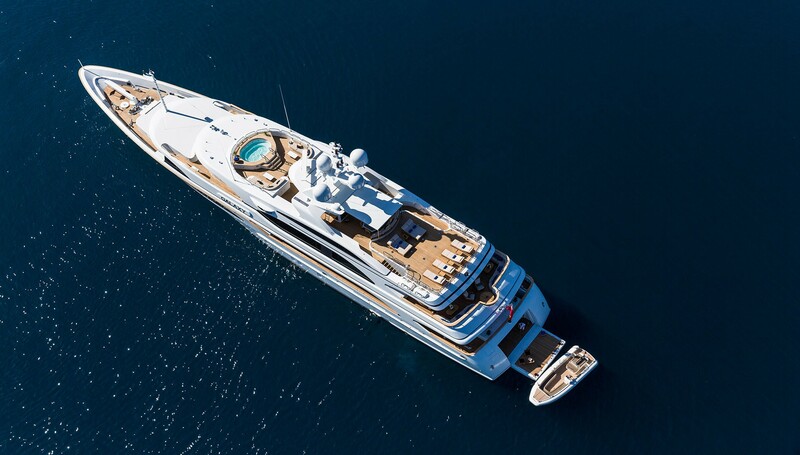 & C.D. 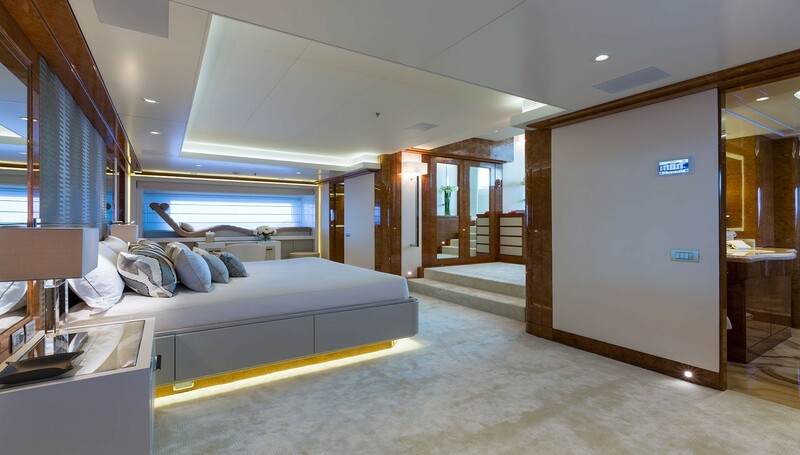 library and Communications two Cell Satellite F77 and two voice lines and also a fax Satellite and a fax V Sat high speed internet. 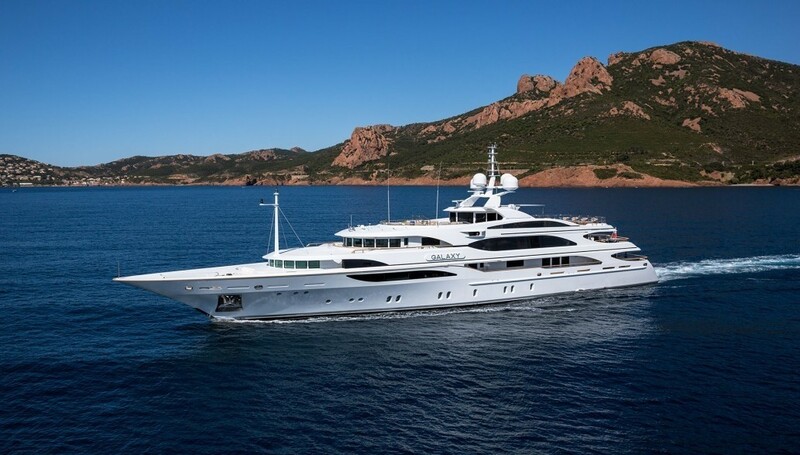 She also has a lift and a gym (cross trainer bike, and a weight machine with as much resistance as anyone might care to lift, for as many reps) as well as Spa Pool tub, a wine cellar, and great sun beds. 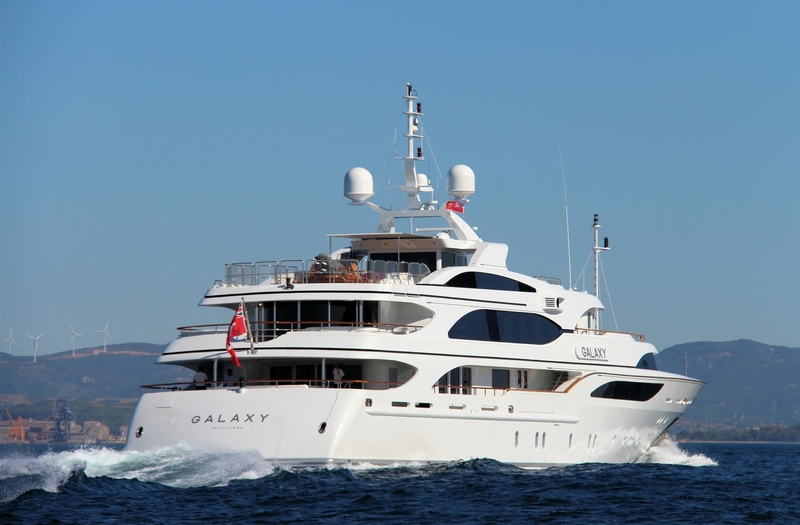 Galaxy has the facility to land a helicopter, with prior notice.